The Oklahoma Capitol Preservation Commission has approved a prime location just across from the East entrance to the Capitol as the future site of the Bill of Rights Monument at the Oklahoma Capitol. The site was first suggested by State Capitol Restoration Project Manager Trait Thompson, and subsequently won the support of Dan Ross, Capitol Assets Management Administrator at OMES (the Office of Management and Enterprise Services), and Duane Mass, Architect of the Capitol, who then brought it to the CPC for approval. 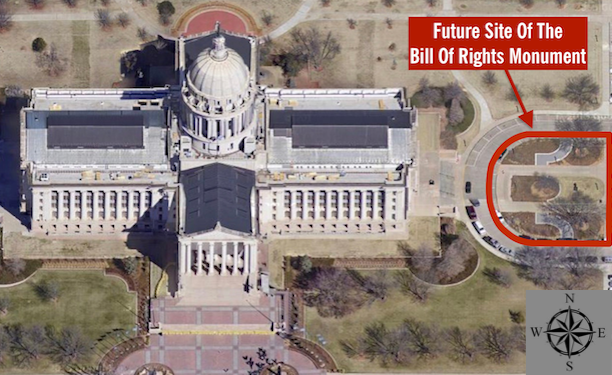 MyBillofRights.org is extremely grateful for the input and guidance we received from these individuals and their agencies, as well as for their active engagement in determining the best possible site for the Bill of Rights Monument within the context of the Capitol’s overall master plan. We are also grateful for the support of CPC Chairperson Vickie Hicks and all commission members present, as well as the efforts of our Oklahoma Project Committee members Natalie Shirley, Gary W. Banz and Rita Aragon. All contributions are tax deductible to the full extent allowable, and will be acknowledged by email and snail mail, so please include an email address if contributing by check. Make a one-time contribution to the Oklahoma Monument Fund. Make a monthly contribution to the Oklahoma Monument Fund. For questions and further information, the Project Committee’s phone is (405) 919-4881. You can also email us by clicking the link below.